Jimski: I presume this is real and not spam. 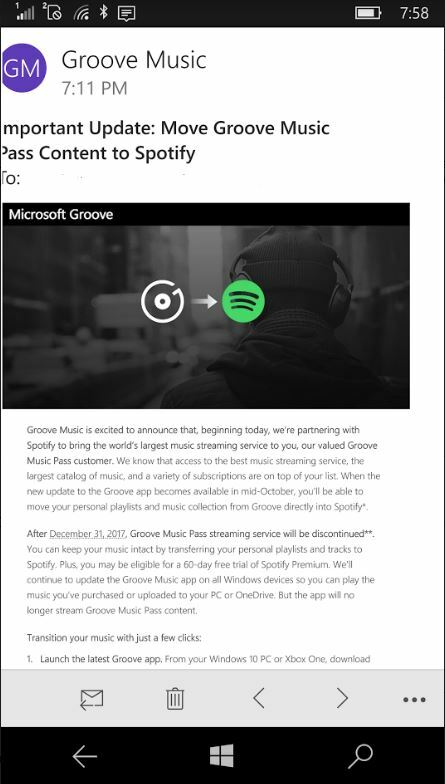 So Microsoft is divesting themselves of their music service? Are they buying Spotify? Or is this another move away from typical consumers and mobile platforms. I already got my Groove renewal email, which occurs on November 1st. Wonder how they will handle that. Does Spotify even have a relatively useful app for Windows phone? Sad day for consumers as Microsoft goes all out for the Cloud, Business and of course, Xbox (for gaming only). Jimski: Oh, and this comes just weeks, or maybe years, before the fabled Harmon Kardon Cortana speaker, you know, the one that plays MUSIC, is to be released. Wanna bet that never makes to market. Jimbo: From my understanding MS is getting completely out of the music market. Check out the FAQ from the Windows Phone (I can’t type that with a straight face) Blog. Keep the conversation going, drop a comment!